Dairy is my favorite food group. And of all the dairy I can get, I love cheese the best. Years ago, I thought it pretty much impossible to store cheese long term in my food storage. Then, I found freeze dried shredded cheese and I was so excited! Unfortunately, that excitement waned a bit as I struggled to figure out how to use it. I was afraid that it was too good to be true. Luckily, freeze dried cheese truly is wonderful as long as you know how to use it, and I did eventually figure out how to do just that! I’ll give you a few tips today, but if you are ready for a laugh, read the next couple of stories to learn what not to do when hydrating freeze dried cheese. I had promised to make pizza for one of my first THRIVE parties back in late 2010. I needed cheese, but I had never hydrated it and there wasn’t much info available about how to do that. Well, I knew that everything else I’d tried hydrated quicker in warm or hot water. So, I poured a bunch of hot water over a bowl of freeze dried cheese. Oops! Hot water melts cheese! I ended up with a big bowl of melted cheese that didn’t work too well for pizza. After the attempt above, I had moved on to hydrating small amounts of cheese by putting it in a bowl with cold water and then straining it after an hour or so. This worked, but was tedious. Then in late 2011, I was in Hawaii preparing for a HUGE show. Hundreds of people were coming to learn how to cook with their freeze dried food storage. We needed to hydrate 3 or 4 full cans of cheese. Since the bowl method had been working for me, we tried that and dumped all 4 cans in a bowl together. Well, the bowl method didn’t work with that much cheese. The weight was too much and it just ended up in huge clumps. So, yes, laugh! I hope my story helps you realize that everyone makes mistakes! Having a bit of a learning curve is okay. Just don’t give up. haha! In 2012, Thrive Life (called Shelf Reliance then) hired an amazing professional Chef. I guess they had quite a few consultant struggling to really use things like freeze dried cheese in their everyday cooking. YAY! Chef Todd and saved me from giving up on freeze dried cheese with a fabulous idea for hydrating it. When I hydrate it using his method it works just like any cheese I buy at the grocery store. It is so simple! Simply put the cheese you want to hydrate in a bowl. Then add water slowly while stirring gently. As soon as all the cheese is just barely coated in water, stop adding water. If the water puddles on the bottom, you’ve added too much water…just pour a bit out! Freeze Dried cheese does not hydrate and melt at the same time well. For example, if you throw it dry into a soup, it will hydrate but not melt well. It is better to hydrate first. 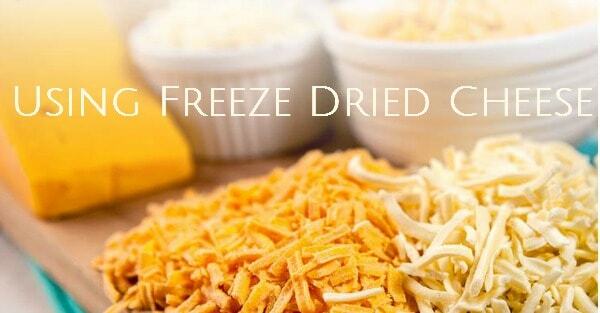 Freeze dried cheese makes a great snack dry! The cheddar tastes just like cheez-its! My kids love it. So do I actually! Once re-hydrated, it can be refrigerated for up to a week or so. If you would like to add freeze dried cheese to your family’s food storage, you can find my favorite brand (Thrive) here. I had the cheese from thrive and realized it’s not a good snack… ha ha. I think the cheddar tastes like cheeze-its, but that is the only one I snack on! Thanks for the video. We have Mountain House cheese and a wood burning pizza oven. I just got a Harvest Right Freeze Dryer and have done my first batch of cheese. This was wally useful. Thanks! I had no idea I needed to do this to use the cheese. You are very welcome Fran! I’m glad to know it was helpful!